In decennial census data products, geographic entities usually are presented in an hierarchical arrangement or as an inventory listing. Figure A-1, which is a diagram of the geographic hierarchy, presents this information as a series of "nesting" relationships. For example, a line joining the lower-level entity "place" and the higher-level entity "state" means that a place cannot cross a state boundary; a line linking "census tract" and "county" means that a census tract cannot cross a county line; and so forth. Exceptions to the standard hierarchical presentation occur in the case of some American Indian/Alaska Native area (AIANA) entities, which do not necessarily "nest" within states and counties. For instance, the following American Indian entities can cross state lines: federally recognized American Indian reservations, off-reservation trust lands, tribal subdivisions, and tribal designated statistical areas. National summary data for American Indian reservations may be presented as an alphabetical listing of reservation names followed by the state portions of each reservation. Also, a census tract or block group delineated by American Indian tribal authorities may be located in more than one state or county (see CENSUS TRACT, TRIBAL BLOCK GROUP, and TRIBAL CENSUS TRACT) for the purpose of presenting census data in the American Indian/Alaska Native area/Hawaiian home land (AIANA/HHL) hierarchy. 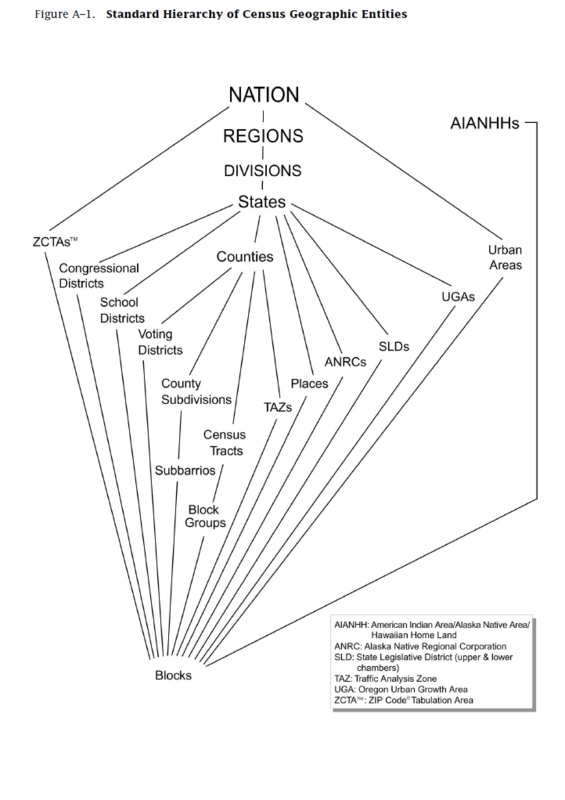 The diagram in Figure A-2 shows geographic relationships among geographic entities in the AIANA/HHL hierarchy. It does not show the geographic levels "county," "county subdivision," and "place" because AIANA/HHL entities do not necessarily nest within them. The definitions below are for geographic entities and concepts that the U.S. Census Bureau includes in its standard data products. Not all entities and concepts are shown in any one data product. There are both legal and statistical American Indian, Alaska Native, and native Hawaiian entities for which the U.S. Census Bureau provides data for Census 2000. The legal entities consist of federally recognized American Indian reservations and off-reservation trust land areas, the tribal subdivisions that can divide these entities, state recognized American Indian reservations, Alaska Native Regional Corporations, and Hawaiian home lands. 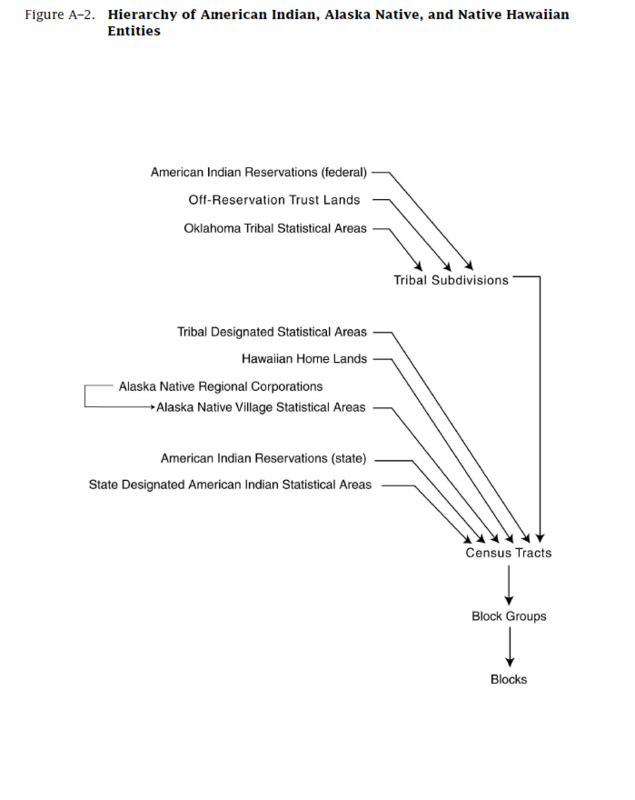 The statistical entities are Alaska Native village statistical areas, Oklahoma tribal statistical areas, tribal designated statistical areas, and state designated American Indian statistical areas. Tribal subdivisions can exist within the statistical Oklahoma tribal statistical areas. In all cases, these areas are mutually exclusive in that no American Indian, Alaska Native, or Hawaiian home land can overlap another tribal entity, except for tribal subdivisions, which subdivide some American Indian entities, and Alaska Native village statistical areas, which exist within Alaska Native Regional Corporations. In some cases where more than one tribe claims jurisdiction over an area, the U.S. Census Bureau creates a joint use area as a separate entity to define this area of dual claims. The following provides more detail about each of the various American Indian areas, Alaska Native areas, and Hawaiian home lands. Alaska Native Regional Corporations (ANRCs) are corporate entities established to conduct both business and nonprofit affairs of Alaska Natives pursuant to the Alaska Native Claims Settlement Act of 1972 (Public Law 92-203). Twelve ANRCs are geographic entities that cover most of the state of Alaska (the Annette Island Reserve-an American Indian reservation-is excluded from any ANRC). (A thirteenth ANRC represents Alaska Natives who do not live in Alaska and do not identify with any of the 12 corporations; the U.S. Census Bureau does not provide data for this ANRC because it has no geographic extent.) The boundaries of ANRCs have been legally established. The U.S. Census Bureau offers representatives of the 12 nonprofit ANRCs the opportunity to review and update the ANRC boundaries. The U.S. Census Bureau first provided data for ANRCs for the 1990 census. Each ANRC is assigned a five-digit Federal Information Processing Standards (FIPS) code, which is assigned in alphabetical order by ANRC name. Alaska Native village statistical areas (ANVSAs) are statistical entities that represent the densely settled portion of Alaska Native villages (ANVs), which constitute associations, bands, clans, communities, groups, tribes or villages, recognized pursuant to the Alaska Native Claims Settlement Act of 1972 (Public Law 92-203). ANVSAs are reviewed and delineated by officials of the ANV (or officials of the Alaska Native Regional Corporation (ANRC) in which the ANV is located if no ANV official chooses to participate in the delineation process) solely for data presentation purposes. An ANVSA may not overlap the boundary of another ANVSA, an American Indian reservation, or a tribal designated statistical area. The U.S. Census Bureau first provided data for ANVSAs for the 1990 census. Each ANVSA is assigned a national four-digit census code ranging from 6000 through 7999. Each ANVSA also is assigned a state-based five-digit Federal Information Processing Standards (FIPS) code. Both the census and FIPS codes are assigned in alphabetical order by ANVSA name. Federal American Indian reservations are areas that have been set aside by the United States for the use of tribes, the exterior boundaries of which are more particularly defined in the final tribal treaties, agreements, executive orders, federal statutes, secretarial orders, or judicial determinations. The U.S. Census Bureau recognizes federal reservations as territory over which American Indian tribes have primary governmental authority. These entities are known as colonies, communities, pueblos, rancherias, ranches, reservations, reserves, villages, Indian communities, and Indian villages. The Bureau of Indian Affairs maintains a list of federally recognized tribal governments. The U.S. Census Bureau contacts representatives of American Indian tribal governments to identify the boundaries for federal reservations. Some state governments have established reservations for tribes recognized by the state. A governor-appointed state liaison provides the names and boundaries for state recognized American Indian reservations to the U.S. Census Bureau. The names of these reservations are followed by "(State)" in census data presentations. Federal reservations may cross state boundaries, and federal and state reservations may cross county, county subdivision, and place boundaries. For reservations that cross state boundaries, only the portions of the reservations in a given state are shown in the data products for that state. Lands that are administered jointly and/or are claimed by two tribes, whether federally or state recognized, are called "joint use areas," and are treated as if they are separate American Indian reservations for data presentation purposes. The entire reservations are shown in data products for the United States. The U.S. Census Bureau first provided data for American Indian reservations in the 1970 census. Each federal American Indian reservation is assigned a four-digit census code ranging from 0001 through 4999. These census codes are assigned in alphabetical order of American Indian reservation names nationwide, except that joint use areas appear at the end of the code range. Each state American Indian reservation is assigned a four-digit census code ranging from 9000 through 9499. Each American Indian reservation also is assigned a five-digit Federal Information Processing Standards (FIPS) code; because FIPS codes are assigned in alphabetical sequence within each state, the FIPS code is different in each state for reservations that include territory in more than one state. Trust lands are areas for which the United States holds title in trust for the benefit of a tribe (tribal trust land) or for an individual Indian (individual trust land). Trust lands can be alienated or encumbered only by the owner with the approval of the Secretary of the Interior or his/her authorized representative. Trust lands may be located on or off of a reservation. The U.S. Census Bureau recognizes and tabulates data for reservations and off-reservation trust lands because American Indian tribes have primary governmental authority over these lands. Primary tribal governmental authority generally is not attached to tribal lands located off the reservation until the lands are placed in trust. In the U.S. Census Bureau's data tabulations, off-reservation trust lands always are associated with a specific federally recognized reservation and/or tribal government. Such trust lands may be located in more than one state. Only the portions of off-reservation trust lands in a given state are shown in the data products for that state; all off-reservation trust lands associated with a reservation or tribe are shown in data products for the United States. The U.S. Census Bureau first provided trust land data for off-reservation tribal trust lands in the 1980 census; in 1990, the trust land data included both tribal and individual trust lands. The U.S. Census Bureau does not identify restricted fee land or land in fee simple status as a specific geographic category. In decennial census data tabulations, off-reservation trust lands are assigned a four-digit census code and a five-digit Federal Information Processing Standards (FIPS) code that is the same as that for the reservation with which they are associated. As with reservations, FIPS codes for off-reservation trust lands are unique within state, so they will differ if they extend into more than one state. The FIPS codes for such off-reservation trust lands are the same as those for the associated reservation. In the TIGER/Line® products, a letter code-" T" for tribal and "I" for individual- identifies off-reservation trust lands. In decennial census data tabulations, a trust land flag uniquely identifies off-reservation trust lands. Printed reports show separate tabulations for all off-reservation trust land areas, but do not provide separate tabulations for the tribal versus individual trust lands. Trust lands associated with tribes that do not have a reservation are presented and coded by tribal name, interspersed alphabetically among the reservation names. American Indian tribal subdivisions are administrative subdivisions of federally recognized American Indian reservations, off-reservation trust lands, or Oklahoma tribal statistical areas (OTSAs), known as areas, chapters, communities, or districts. These entities are internal units of self-government or administration that serve social, cultural, and/or economic purposes for the American Indians on the reservations, off-reservation trust lands, or OTSAs. The U.S. Census Bureau obtains the boundary and name information for tribal subdivisions from tribal governments. The U.S. Census Bureau first provided data for American Indian tribal subdivisions in the 1980 census when it identified them as "American Indian subreservation areas." It did not provide data for these entities in conjunction with the 1990 census. Each American Indian tribal subdivision is assigned a three-digit census code that is alphabetically in order and unique within each reservation, associated off-reservation trust land, and OTSA. Each tribal subdivision also is assigned a five-digit Federal Information Processing Standards (FIPS) code. FIPS codes are assigned alphabetically within state; the FIPS codes are different in each state for tribal subdivisions that extend into more than one state. Hawaiian home lands (HHLs) are areas held in trust for native Hawaiians by the state of Hawaii, pursuant to the Hawaiian Homes Commission Act of 1920, as amended. The U.S. Census Bureau obtained the names and boundaries of HHLs from state officials. HHLs are a new geographic entity for Census 2000. Each HHL area is assigned a national four-digit census code ranging from 5000 through 5499 based on the alphabetical sequence of each HHL name. Each HHL also is assigned a five-digit Federal Information Processing Standards (FIPS) code in alphabetical order within the state of Hawaii. Oklahoma tribal statistical areas (OTSAs) are statistical entities identified and delineated by the U.S. Census Bureau in consultation with federally recognized American Indian tribes in Oklahoma that do not currently have a reservation, but once had a reservation in that state. Boundaries of OTSAs will be those of the former reservations in Oklahoma, except where modified by agreements with neighboring tribes for data presentation purposes. OTSAs replace the "tribal jurisdiction statistical areas" of the 1990 census. The U.S. Census Bureau first provided data for the former Oklahoma reservations in conjunction with the 1980 census, when it defined a single all encompassing geographic entity called the "Historic Areas of Oklahoma (excluding urbanized areas)." State designated American Indian statistical areas (SDAISAs) are statistical entities for state recognized American Indian tribes that do not have a state recognized land base (reservation). SDAISAs are identified and delineated for the U.S. Census Bureau by a state liaison identified by the governor's office in each state. SDAISAs generally encompass a compact and contiguous area that contains a concentration of people who identify with a state recognized American Indian tribe and in which there is structured or organized tribal activity. A SDAISA may not be located in more than one state unless the tribe is recognized by both states, and it may not include area within an American Indian reservation, off-reservation trust land, Alaska Native village statistical area, tribal designated statistical area (TDSA), or Oklahoma tribal statistical area. The U.S. Census Bureau established SDAISAs as a new geographic statistical entity for Census 2000, to differentiate between state recognized tribes without a land base and federally recognized tribes without a land base. For the 1990 census, all such tribal entities had been identified as TDSAs. Each SDAISA is assigned a four-digit census code ranging from 9500 through 9999 in alphabetical sequence of SDAISA names nationwide. Each SDAISA also is assigned a five-digit Federal Information Processing Standards (FIPS) code in alphabetical order within state. Tribal designated statistical areas (TDSAs) are statistical entities identified and delineated for the U.S. Census Bureau by federally recognized American Indian tribes that do not currently have a federally recognized land base (reservation or off-reservation trust land). A TDSA generally encompasses a compact and contiguous area that contains a concentration of people who identify with a federally recognized American Indian tribe and in which there is structured or organized tribal activity. A TDSA may be located in more than one state, and it may not include area within an American Indian reservation, off-reservation trust land, Alaska Native village statistical area, state designated American Indian statistical area (SDAISA), or Oklahoma tribal statistical area. The U.S. Census Bureau first reported data for TDSAs in conjunction with the 1990 census, when both federally and state recognized tribes could identify and delineate TDSAs. TDSAs now apply only to federally recognized tribes. State recognized tribes without a land base, including those that were TDSAs in 1990, are identified as SDAISAs, a new geographic entity for Census 2000. Each TDSA is assigned a four-digit census code ranging from 8000 through 8999 in alphabetical sequence of TDSA names nationwide. Each TDSA also is assigned a five-digit Federal Information Processing Standards (FIPS) code in alphabetical order within state; because FIPS codes are assigned within each state, the FIPS code is different in each state for TDSAs that extend into more than one state. Area measurement data provide the size, in square units (metric and nonmetric) of geographic entities for which the U.S. Census Bureau tabulates and disseminates data. Area is calculated from the specific boundary recorded for each entity in the U.S. Census Bureau's geographic database (see TIGER® database). These area measurements are recorded as whole square meters. (To convert square meters to square kilometers, divide by 1,000,000; to convert square kilometers to square miles, divide by 2.58999; to convert square meters to square miles, divide by 2,589,988.) The U.S. Census Bureau provides area measurement data for both land area and total water area. The water area figures include inland, coastal, Great Lakes, and territorial water. (For the 1990 census, the U.S. Census Bureau provided area measurements for land and total water; water area for each of the four water classifications was available in the Geographic Identification Code Scheme (GICS) product only.) "Inland water" consists of any lake, reservoir, pond, or similar body of water that is recorded in the U.S. Census Bureau's geographic database. It also includes any river, creek, canal, stream, or similar feature that is recorded in that database as a twodimensional feature (rather than as a single line). The portions of the oceans and related large embayments (such as the Chesapeake Bay and Puget Sound), the Gulf of Mexico, and the Caribbean Sea that belong to the United States and its territories are classified as "coastal" and "territorial" waters; the Great Lakes are treated as a separate water entity. Rivers and bays that empty into these bodies of water are treated as "inland water" from the point beyond which they are narrower than one nautical mile across. Identification of land and inland, coastal, territorial, and Great Lakes waters is for data presentation purposes only and does not necessarily reflect their legal definitions. Land and water area measurements may disagree with the information displayed on U.S. Census Bureau maps and in the TIGER® database because, for area measurement purposes, features identified as "intermittent water" and "glacier" are reported as land area. For this reason, it may not be possible to derive the land area for an entity by summing the land area of its component census blocks. In addition, the water area measurement reported for some geographic entities includes water that is not included in any lower-level geographic entity. Therefore, because water is contained only in a higher-level geographic entity, summing the water measurements for all the component lower-level geographic entities will not yield the water area of that higher-level entity. This occurs, for example, where water is associated with a county but is not within the legal boundary of any minor civil division. Crews-of-vessels entities (see CENSUS TRACT and CENSUS BLOCK) do not encompass territory and, therefore, have no area measurements. The accuracy of any area measurement data is limited by the accuracy inherent in (1) the location and shape of the various boundary information in the TIGER® database, (2) the location and shapes of the shorelines of water bodies in that database, and (3) rounding affecting the last digit in all operations that compute and/or sum the area measurements. Most BG's were delineated by local participants as part of the U.S. Census Bureau's Participant Statistical Areas Program. The U.S. Census Bureau delineated BG's only where a local, state, or tribal government declined to participate or where the U.S. Census Bureau could not identify a potential local or tribal participant. BG's never cross the boundaries of states, counties, or statistically equivalent entities, except for a BG delineated by American Indian tribal authorities, and then only when tabulated within the American Indian hierarchy (see TRIBAL BLOCK GROUP). BG's never cross the boundaries of census tracts, but may cross the boundary of any other geographic entity required as a census block boundary (see CENSUS BLOCK). In decennial census data tabulations, a BG may be split to present data for every unique combination of American Indian area, Alaska Native area, Hawaiian home land, congressional district, county subdivision, place, voting district, or other tabulation entity shown in the data products. For example, if BG 3 is partly in a city and partly outside the city, there are separate tabulated records for each portion of BG 3. BG's are used in tabulating data nationwide, as was done for the 1990 census, for all block-numbered areas in the 1980 census, and for selected areas in the 1970 census. For data presentation purposes, BG's are a substitute for the enumeration districts (EDs) used for reporting data in many parts of the United States for the 1970 and 1980 censuses and in all areas before 1970. Also, BG's are the lowest level of the geographic hierarchy for which the U.S. Census Bureau tabulates and presents sample data. Changes in treaties or executive orders, and governmental action placing additional lands in trust. Redistricting for congressional districts or county subdivisions that represent single-member districts for election to a county governing board. Statistical entity boundaries generally are reviewed by local, state, or tribal governments and can have changes to adjust boundaries to visible features to better define the geographic area each encompasses or to account for shifts and changes in the population distribution within an area. The historical counts shown for counties, county subdivisions, places, and American Indian, Alaska Native, and Native Hawaiian areas are not updated for such changes, and thus reflect the population and housing units in each entity as delineated at the time of each decennial census. Boundary changes are not reported for some entities, such as census designated places and block groups. Changes to the boundaries for census tracts and, for the first time, for census blocks are available in relationship files, which are only available in computer-readable form. The census tract relationship files feature the relationship of census tracts/block numbering areas at the time of the 1990 census to census tracts for Census 2000, and vice versa, including partial relationships. For the first time, the census tract relationship files show a measure of the magnitude of change using the proportion of the length of roads and sides of roads contained in partial census tracts. This information can be used to proportion the data for the areas where census tracts have changed. - 1990 tabulation block to 2000 tabulation block. Census tract relationship files and block relationship files are not geographic equivalency files. For a true areal comparison between the census tracts/block numbering areas and blocks used for the 1990 census and the census tracts and blocks used for Census 2000 (as well as other geographic areas), it is necessary to use the 2000 TIGER/Line® files. The 2000 TIGER/Line files will contain 1990 and 2000 boundaries for counties and statistically equivalent entities, county subdivisions, places, American Indian areas, Alaska Native village statistical areas, census tracts, census blocks, and by derivation from the census blocks, block groups. Census blocks are areas bounded on all sides by visible features, such as streets, roads, streams, and railroad tracks, and by invisible boundaries, such as city, town, township, and county limits, property lines, and short, imaginary extensions of streets and roads. Generally, census blocks are small in area; for example, a block bounded by city streets. However, census blocks in sparsely settled areas may contain many square miles of territory. All territory in the United States, Puerto Rico, and the Island Areas has been assigned block numbers, as was the case for the 1990 census. To improve operational efficiency and geographic identifications, the U.S. Census Bureau has introduced different numbering systems for tabulation blocks used in decennial census data products, and for collection blocks, used in administering the census. (In 1990, there generally was a single numbering system.) Collection block numbers are available only in the TIGER/Line® data products; the U.S. Census Bureau does not tabulate data for collection blocks. Many tabulation blocks, used in decennial census data products, represent the same geographic area as the collection blocks used in the Census 2000 enumeration process. Where the collection blocks include territory in two or more geographic entities, each unique piece required for data tabulation is identified as a separate tabulation block with a separate block number. It is possible for two or more collection blocks to be combined into a single tabulation block. This situation can occur when a visible feature established as a collection block boundary is deleted during the field update operation. Tabulation blocks do not cross the boundaries of any entity for which the U.S. Census Bureau tabulates data, including American Indian areas, Alaska Native areas, Hawaiian home lands, census tracts, congressional districts, counties, county subdivisions, places, state legislative districts, urban and rural areas, school districts, voting districts, and ZIP Code® tabulation areas. Tabulation blocks also generally do not cross the boundaries of certain landmarks, including military installations, national parks, and national monuments. Tabulation blocks are identified uniquely within census tract by means of a four-digit number. (The 1990 census block numbers had three digits, with a potential alphabetic suffix.) The Census 2000 collection blocks are numbered uniquely within county (or statistically equivalent entity), and consist of four or five digits. For its Census 2000 data tabulations, the U.S. Census Bureau created a unique set of census block numbers immediately before beginning the tabulation process. These are the census block numbers seen in the data presentations. For the 1990 census, the U.S. Census Bureau created a separate block with a suffix of "Z" to identify crews-of-vessels population. For Census 2000, crews-of-vessels population is assigned to the land block identified by the U.S. Census Bureau as associated with the home port of the vessel. Participants in certain U.S. Census Bureau-sponsored programs were able to request that line features in the TIGER® database be held as tabulation block boundaries, provided that these conformed to U.S. Census Bureau criteria. This option was available to participants in the Census 2000 Redistricting Data Program (the Block Boundary Suggestion Project), American Indian and Alaska Native Area Tribal Review (Block Definition Project), and the District of Columbia and the Puerto Rico Block Boundary Definition Project. The U.S. Census Bureau introduced a different method for identifying the water areas of census blocks. For the 1990 census, water was not uniquely identified within a census block; instead, all water area internal to a block group was given a single block number ending in "99" (for example, in block group 1, all water was identified as block 199). A suffix was added to each water block number where the block existed in more than one tabulation entity within its block group. For Census 2000, water area located completely within the boundary of a single land tabulation block has the same block number as that land block. Water area that touches more than one land block is assigned a unique block number not associated with any adjacent land block. The water block numbers begin with the block group number followed by "999" and proceed in descending order (for example, in block group 3, the numbers assigned to water areas that border multiple land blocks are 3999, 3998, etc.). In some block groups, the numbering of land blocks might use enough of the available numbers to reach beyond the 900 range within the block group. For this reason, and because some land blocks include water (ponds and small lakes), no conclusions about whether a block is all land or all water can be made by looking at the block number. The land/water flag, set at the polygon level in the TIGER® database and shown in TIGER/Line® and statistical data tabulation files, is the only way to know if a block is all water when viewing the computer files. On maps, water areas are shown with a screen symbol. Census divisions are groupings of states and the District of Columbia that are subdivisions of the four census regions. There are nine census divisions, which the U.S. Census Bureau established in 1910 for the presentation of census data. Each census division is identified by a one-digit census code; the same number appears as the first digit in the two-digit census state code (see STATE). Puerto Rico and the Island Areas are not part of any census region or census division. For a list of all census regions, census divisions, and their constituent states, see Figure A-3. Census regions are groupings of states and the District of Columbia that subdivide the United States for the presentation of census data. There are four census regions-Northeast, Midwest, South, and West. Each of the four census regions is divided into two or more census divisions. Before 1984, the Midwest region was named the North Central region. From 1910, when census regions were established, through the 1940s, there were three census regions-North, South, and West. Each census region is identified by a single-digit census code. Census tracts are small, relatively permanent statistical subdivisions of a county or statistically equivalent entity delineated by local participants as part of the U.S. Census Bureau's Participant Statistical Areas Program. The U.S. Census Bureau delineated census tracts where no local participant existed or where a local or tribal government declined to participate. The primary purpose of census tracts is to provide a stable set of geographic units for the presentation of decennial census data. This is the first decennial census for which the entire United States is covered by census tracts. For the 1990 census, some counties had census tracts and others had block numbering areas (BNAs). For Census 2000, all BNAs were replaced by census tracts, which may or may not represent the same areas. Census tracts in the United States, Puerto Rico, and the Virgin Islands of the United States generally have between 1,500 and 8,000 people, with an optimum size of 4,000 people. For American Samoa, the Northern Mariana Islands, and Guam, the optimum size is 2,500 people. Counties and statistically equivalent entities with fewer than 1,500 people have a single census tract. Census tracts on American Indian reservations, off-reservation trust lands, and special places must contain a minimum of 1,000 people. (Special places include correctional institutions, military installations, college campuses, workers dormitories, hospitals, nursing homes, and group homes.) When first delineated, census tracts are designed to be relatively homogeneous with respect to population characteristics, economic status, and living conditions. The spatial size of census tracts varies widely depending on the density of settlement. Census tract boundaries are delineated with the intention of being maintained over many decades so that statistical comparisons can be made from decennial census to decennial census. However, physical changes in street patterns caused by highway construction, new developments, and so forth, may require occasional boundary revisions. In addition, census tracts occasionally are split due to population growth or combined as a result of substantial population decline. Census tracts are identified by a four-digit basic number and may have a two-digit numeric suffix; for example, 6059.02. The decimal point separating the four-digit basic tract number from the two-digit suffix is shown in the printed reports and on census maps. In computer-readable files, the decimal point is implied. Many census tracts do not have a suffix; in such cases, the suffix field is either left blank or is zero-filled. Leading zeros in a census tract number (for example, 002502) are shown only in computer-readable files. Census tract suffixes may range from .01 to .98. For the 1990 census, the .99 suffix was reserved for census tracts/block numbering areas (BNAs) that contained only crews-of-vessels population; for Census 2000, the crews-of-vessels population is included with the related census tract. Census tract numbers range from 1 to 9999 and are unique within a county or statistically equivalent entity. The U.S. Census Bureau reserves the basic census tract numbers 9400 to 9499 for census tracts delineated within or to encompass American Indian reservations and off-reservation trust lands that exist in multiple states or counties (see TRIBAL CENSUS TRACTS). The number 0000 in computer-readable files identifies a census tract delineated to provide complete coverage of water area in territorial seas and the Great Lakes. Congressional districts (CDs) are the 435 areas from which people are elected to the U.S. House of Representatives. After the apportionment of congressional seats among the states, based on census population counts, each state is responsible for establishing CDs for the purpose of electing representatives. Each CD is to be as equal in population to all other CDs in the state as practicable. The CDs in effect at the time of Census 2000 are those of the 106th Congress, whose session began in January 1999. The CDs of the 103rd Congress (January 1993 to 1995) were the first to reflect redistricting based on the 1990 census. These CD boundaries and numbers remained in effect until after Census 2000, except where a state initiative or a court-ordered redistricting had required a change. Six states redistricted for the 104th Congress (Georgia, Louisiana, Maine, Minnesota, South Carolina, and Virginia), five states redistricted for the 105th Congress (Florida, Georgia, Kentucky, Louisiana, and Texas), and three states (New York, North Carolina, and Virginia) redistricted for the 106th Congress. The 108th Congress will be the first to reflect reapportionment and redistricting based on Census 2000 data. CDs are identified with a two-digit Federal Information Processing Standards (FIPS) code. The code "00" is used for states with a single representative. American Samoa, Guam, the Virgin Islands of the United States, and the District of Columbia are represented in the House of Representatives by a delegate, and Puerto Rico by a resident commissioner, all of whom may not vote on the floor of the House of Representatives, but may vote on legislation as it is considered by committees to which they have been named. In computerreadable data products that display a congressional district field, the two-digit FIPS code "98" is used to identify such representational areas. The Northern Mariana Islands does not have representation in Congress. The FIPS code "99" identifies areas with no representation in Congress. The primary legal divisions of most states are termed "counties." In Louisiana, these divisions are known as parishes. In Alaska, which has no counties, the statistically equivalent entities are census areas, city and boroughs (as in Juneau City and Borough), a municipality (Anchorage), and organized boroughs. Census areas are delineated cooperatively for data presentation purposes by the state of Alaska and the U.S. Census Bureau. In four states (Maryland, Missouri, Nevada, and Virginia), there are one or more incorporated places that are independent of any county organization and thus constitute primary divisions of their states; these incorporated places are known as "independent cities" and are treated as equivalent to counties for data presentation purposes. (In some data presentations, they may be treated as county subdivisions and places.) The District of Columbia has no primary divisions, and the entire area is considered equivalent to a county for data presentation purposes. In American Samoa, the primary divisions are districts and islands; in the Northern Mariana Islands, municipalities; in the Virgin Islands of the United States, the principal islands of St. Croix, St. John, and St. Thomas. Guam has no primary divisions, and the entire area is considered equivalent to a county for data presentation purposes. Each county and statistically equivalent entity is assigned a three-digit Federal Information Processing Standards code that is unique within state. These codes are assigned in alphabetical order of county or county equivalent within state, except for the independent cities, which are assigned codes higher than and following the listing of counties. County subdivisions are the primary divisions of counties and statistically equivalent entities for data presentation purposes. They include census county divisions, census subareas, minor civil divisions (MCDs), unorganized territories, and incorporated places that are independent of any MCD. Each county subdivision is assigned a five-digit Federal Information Processing Standards (FIPS) code in alphabetical order within each state. Census county divisions (CCDs) are county subdivisions that were delineated by the U.S. Census Bureau, in cooperation with state and local government officials for data presentation purposes. CCDs have been established in 21 states where there are no legally established minor civil divisions (MCDs), where the MCDs do not have governmental or administrative purposes, where the boundaries of the MCDs are ambiguous or change frequently, and/or where the MCDs generally are not known to the public. CCDs have no legal functions and are not governmental units. The boundaries of CCDs usually are delineated to follow visible features and coincide with census tracts where applicable. (In a few instances, two CCDs may constitute a single census tract.) The name of each CCD is based on a place, county, or well-known local name that identifies its location. CCDs have been established in the following 21 states: Alabama, Arizona, California, Colorado, Delaware, Florida, Georgia, Hawaii, Idaho, Kentucky, Montana, Nevada, New Mexico, Oklahoma, Oregon, South Carolina, Tennessee, Texas, Utah, Washington, and Wyoming. Census subareas are statistical subdivisions of boroughs, census areas, city and boroughs, and the municipality (entities that are statistically equivalent to counties) in Alaska. Census subareas are delineated cooperatively by the state of Alaska and the U.S. Census Bureau. They were first used for data presentation purposes in conjunction with the 1980 census. Minor civil divisions (MCDs) are the primary governmental or administrative divisions of a county in many states (parish in Louisiana). MCDs represent many different kinds of legal entities with a wide variety of governmental and/or administrative functions. MCDs are variously designated as American Indian reservations, assessment districts, boroughs, charter townships, election districts, election precincts, gores, grants, locations, magisterial districts, parish governing authority districts, plantations, precincts, purchases, road districts, supervisors districts, towns, and townships. In some states, all or some incorporated places are not located in any MCD (independent places) and thus serve as MCDs in their own right. In other states, incorporated places are part of the MCDs in which they are located (dependent places), or the pattern is mixed-some incorporated places are independent of MCDs and others are included within one or more MCDs. Independent cities, which are statistically equivalent to a county, also are treated as a separate MCD equivalent in states containing MCDs. In Maine and New York, there are American Indian reservations and off-reservation trust lands that serve as MCD equivalents; a separate MCD is created in each case where the American Indian area crosses a county boundary. The U.S. Census Bureau recognizes MCDs in the following 28 states: Arkansas, Connecticut, Illinois, Indiana, Iowa, Kansas, Louisiana, Maine, Maryland, Massachusetts, Michigan, Minnesota, Mississippi, Missouri, Nebraska, New Hampshire, New Jersey, New York, North Carolina, North Dakota, Ohio, Pennsylvania, Rhode Island, South Dakota, Vermont, Virginia, West Virginia, and Wisconsin. The District of Columbia has no primary divisions, and the city of Washington is considered equivalent to an MCD for data presentation purposes. Arlington County, VA, also has no MCDs and the entire county is designated as an MCD with the name Arlington. American Samoa: Counties (within the three districts; the two islands have no legal subdivisions). Northern Mariana Islands: Municipal districts. Virgin Islands of the United States: Census subdistricts. The MCDs in 12 states (Connecticut, Maine, Massachusetts, Michigan, Minnesota, New Hampshire, New Jersey, New York, Pennsylvania, Rhode Island, Vermont, and Wisconsin) also serve as general-purpose local governments that generally can perform the same governmental functions as incorporated places. The U.S. Census Bureau presents data for these MCDs in all data products in which it provides data for places. Unorganized territories occur in 10 minor civil division (MCD) states (Arkansas, Indiana, Iowa, Louisiana, Maine, Minnesota, North Carolina, North Dakota, Ohio, and South Dakota) where portions of counties are not included in any legally established MCD or independent incorporated place. The U.S. Census Bureau recognizes such areas as one or more separate county subdivisions for purposes of data presentation. It assigns each unorganized territory a descriptive name, followed by the designation "unorganized territory" or "UT." Unorganized territories were first used for data presentation purposes in conjunction with the 1960 census. Census codes are assigned for a variety of geographic entities, including American Indian area, Alaska Native village statistical area, Hawaiian home land, census division, census region, urbanized area, urban cluster, state legislative district, school district, urban growth area, and voting district. The structure, format, and meaning of census codes used in U.S. Census Bureau data products appear in the appropriate technical documentation. Federal Information Processing Standards (FIPS) codes are assigned for a variety of geographic entities, including American Indian area, Alaska Native area, Hawaiian home land, congressional district, county, county subdivision, metropolitan area, place, and state. The structure, format, and meaning of FIPS codes used in U.S. Census Bureau data products appear in the appropriate technical documentation. Further information about the FIPS 5-2, 6-4, and 9-1 publications (states, counties, and congressional districts, respectively) is available from the Geographic Areas Branch, Geography Division, U.S. Census Bureau, Washington, DC 20233-7400, telephone 301- 457-1099. Further information about the FIPS 55-DC3 publication (places, consolidated cities, county subdivisions, and noncensus locational entities) is available from the Geographic Names Office, National Mapping Division, U.S. Geological Survey, 523 National Center, Reston, VA 20192, telephone 703-648-4544. United States Postal Service (USPS) codes for states are used in all decennial census data products. The codes are two-character alphabetic abbreviations. These codes are the same as the Federal Information Processing Standards two-character alphabetic abbreviations. An internal point is a set of geographic coordinates (latitude and longitude) that is located within a specified geographic entity. A single point is identified for each entity; for many entities, this point represents the approximate geographic center of that entity. If the shape of the entity causes this point to be located outside the boundary of the entity or in a water body, it is relocated to land area within the entity. In computer-readable products, internal points are shown to six decimal places; the decimal point is implied. The first character of the latitude or longitude is a plus (+) or a minus (-) sign. A plus sign in the latitude identifies the point as being in the Northern Hemisphere, while a minus sign identifies a location in the Southern Hemisphere. For longitude, a plus sign identifies the point as being in the Eastern Hemisphere, while a minus sign identifies a location in the Western Hemisphere. The Island Areas of the United States are American Samoa, Guam, the Commonwealth of the Northern Mariana Islands (Northern Mariana Islands), and the Virgin Islands of the United States. The U.S. Census Bureau treats the Island Areas as entities that are statistically equivalent to states for data presentation purposes. Geographic definitions specific to the Island Areas are shown in the appropriate publications and documentation that accompany the data products for the Island Areas. Sometimes the Island Areas are referred to as "Island Territories" or "Insular Areas." For the 1990 and previous censuses, the U.S. Census Bureau referred to the entities as "Outlying Areas." The term "U.S. Minor Outlying Islands" refers to certain small islands under U.S. jurisdiction in the Caribbean and Pacific: Baker Island, Howland Island, Jarvis Island, Johnston Atoll, Kingman Reef, Midway Islands, Navassa Island, Palmyra Atoll, and Wake Island. The general concept of a metropolitan area (MA) is one of a large population nucleus, together with adjacent communities that have a high degree of economic and social integration with that nucleus. Some MAs are defined around two or more nuclei. The MAs and the central cities within an MA are designated and defined by the federal Office of Management and Budget, following a set of official standards that are published in a Federal Register Notice. These standards were developed by the interagency Federal Executive Committee on Metropolitan Areas, with the aim of producing definitions that are as consistent as possible for all MAs nationwide. Each MA must contain either a place with a minimum population of 50,000 or a U.S. Census Bureau-defined urbanized area and a total MA population of at least 100,000 (75,000 in New England). An MA contains one or more central counties. An MA also may include one or more outlying counties that have close economic and social relationships with the central county. An outlying county must have a specified level of commuting to the central counties and also must meet certain standards regarding metropolitan character, such as population density, urban population, and population growth. In New England, MAs consist of groupings of cities and county subdivisions (mostly towns) rather than whole counties. The territory, population, and housing units in MAs are referred to as "metropolitan." The metropolitan category is subdivided into "inside central city" and "outside central city." The territory, population, and housing units located outside territory designated "metropolitan" are referred to as "nonmetropolitan." The metropolitan and nonmetropolitan classification cuts across the other hierarchies; for example, generally there are both urban and rural territory within both metropolitan and nonmetropolitan areas. To meet the needs of various users, the standards provide for a flexible structure of metropolitan definitions that classify each MA either as a metropolitan statistical area (MSA) or as a consolidated metropolitan statistical area divided into primary metropolitan statistical areas. In New England, there also is an alternative county-based definition of MSAs known as the New England County Metropolitan Areas. (See definitions below.) Documentation of the MA standards and how they are applied is available from the Population Distribution Branch, Population Division, U.S. Census Bureau, Washington, DC 20233-8800, telephone 301-457-2419. In each metropolitan statistical area and consolidated metropolitan statistical area, the largest place and, in some cases, one or more additional places are designated as "central cities" under the official standards. A few primary metropolitan statistical areas do not have central cities. The largest central city and, in some cases, up to two additional central cities, are included in the title of the metropolitan area (MA); there also are central cities that are not included in an MA title. An MA central city does not include any part of that place that extends outside the MA boundary. If an area that qualifies as a metropolitan area (MA) has 1 million people or more, two or more primary metropolitan statistical areas (PMSAs) may be defined within it. Each PMSA consists of a large urbanized county or cluster of counties (cities and towns in New England) that demonstrate very strong internal economic and social links, in addition to close ties to other portions of the larger area. When PMSAs are established, the larger MA of which they are component parts is designated a consolidated metropolitan statistical area (CMSA). CMSAs and PMSAs are established only where local governments favor such designations for a large MA. Metropolitan statistical areas (MSAs) are metropolitan areas (MAs) that are not closely associated with other MAs. These areas typically are surrounded by nonmetropolitan counties (county subdivisions in New England). The title of a metropolitan statistical area (MSA) contains the name of its largest central city and up to two additional central city names, provided that the additional places meet specified levels of population, employment, and commuting. Generally, a place with a population of 250,000 or more is in the title, regardless of other criteria. The title of a primary metropolitan statistical area (PMSA) may contain up to three place names, as determined above, or up to three county names, sequenced in order of population size, from largest to smallest. A consolidated metropolitan statistical area (CMSA) title also may include up to three names, the first of which generally is the most populous central city in the area. The second name may be the first city or county name in the most populous remaining PMSA; the third name may be the first city or county name in the next most populous PMSA. A regional designation may be substituted for the second and/or third names in a CMSA title if local opinion supports such a designation and the federal Office of Management and Budget deems it to be unambiguous and suitable. The titles for all metropolitan areas (MAs) also contain the U.S. Postal Services abbreviation for the name of each state in which the MA is located. Each MA is assigned a four-digit Federal Information Processing Standards (FIPS) code, in alphabetical order nationwide. If the fourth digit of the code is "2," it identifies a CMSA. Additionally, there is a separate set of two-digit FIPS codes for CMSAs, also assigned alphabetically. The county containing the first-named city in that MSA/CMSA title (this county may include the first-named cities of other MSAs/CMSAs as well), and Each additional county having at least half its population in the MSAs/CMSAs whose first-named cities are in the previously identified county. NECMAs are not identified for individual primary metropolitan statistical areas. Central cities of a NECMA are those places in the NECMA that qualify as central cities of an MSA or a CMSA. NECMA titles derive from the names of these central cities. Each NECMA is assigned a four-digit Federal Information Processing Standards (FIPS) code. Places, for the reporting of decennial census data, include census designated places, consolidated cities, and incorporated places. Each place is assigned a five-digit Federal Information Processing Standards (FIPS) code, based on the alphabetical order of the place name within each state. If place names are duplicated within a state and they represent distinctly different areas, a separate code is assigned to each place name alphabetically by primary county in which each place is located, or if both places are in the same county, alphabetically by their legal description (for example, "city" before "village" ). Census designated places (CDPs) are delineated for each decennial census as the statistical counterparts of incorporated places. CDPs are delineated to provide census data for concentrations of population, housing, and commercial structures that are identifiable by name but are not within an incorporated place. CDP boundaries usually are defined in cooperation with state, local, and tribal officials. These boundaries, which usually coincide with visible features or the boundary of an adjacent incorporated place or other legal entity boundary, have no legal status, nor do these places have officials elected to serve traditional municipal functions. CDP boundaries may change from one decennial census to the next with changes in the settlement pattern; a CDP with the same name as in an earlier census does not necessarily have the same boundary. For Census 2000, for the first time, CDPs did not need to meet a minimum population threshold to qualify for tabulation of census data. For the 1990 census and earlier censuses, the U.S. Census Bureau required CDPs to qualify on the basis of various minimum population size criteria. Beginning with the 1950 census, the U.S. Census Bureau, in cooperation with state and local governments (and American Indian tribal officials starting with the 1990 census), identified and delineated boundaries and names for CDPs. In the data products issued in conjunction with Census 2000, the name of each such place is followed by "CDP," as was the case for the 1990 and 1980 censuses. In the data products issued in conjunction with the 1950, 1960, and 1970 censuses, these places were identified by "(U)," meaning "unincorporated place." Hawaii is the only state that has no incorporated places recognized by the U.S. Census Bureau. All places shown in the data products for Hawaii are CDPs. By agreement with the state of Hawaii, the U.S. Census Bureau does not show data separately for the city of Honolulu, which is coextensive with Honolulu County. All places in the Northern Mariana Islands and Guam are CDPs. The Virgin Islands of the United States has both CDPs and incorporated places. There are no CDPs in American Samoa; the U.S. Census Bureau treats the traditional villages as statistically equivalent to incorporated places. A consolidated government is a unit of local government for which the functions of an incorporated place and its county or minor civil division (MCD) have merged. The legal aspects of this action may result in both the primary incorporated place and the county or MCD continuing to exist as legal entities, even though the county or MCD performs few or no governmental functions and has few or no elected officials. Where this occurs, and where one or more other incorporated places in the county or MCD continue to function as separate governments, even though they have been included in the consolidated government, the primary incorporated place is referred to as a consolidated city. The presentation of data for consolidated cities varies depending on the geographic presentation. In some hierarchical presentations, consolidated cities are not shown. These presentations include the places within the consolidated city and the "consolidated city (balance)." Although hierarchical presentations do not show the consolidated city, the data for it are the same as the county or county subdivision with which it is coextensive. Other hierarchical presentations do show the consolidated city, county or county subdivision, and (balance) as separate entities. For inventory geographic presentations, the consolidated city appears alphabetically sequenced within the listing of places; in 1990, consolidated places appeared at the end of the listing. The data for the consolidated city include the data for all places that are part of and within the consolidated city. The "consolidated city (balance)" entry shows the data for the portion of the consolidated government minus the separately incorporated places within the consolidated city, and is shown in alphabetical sequence with other places that comprise the consolidated city. For data presentation purposes these "balance" entities are treated as statistically equivalent to a place; they have no legal basis or functions. In summary presentations by size of place, the consolidated city is not included. The places within consolidated cities are categorized by their size, as is the "consolidated city (balance)." A few incorporated places are partially inside and partially outside a consolidated city. Data tabulations by place will include all territory within the place, while the tabulation for the place within a consolidated city is only for part of the place. Each consolidated city is assigned a five-digit Federal Information Processing Standards (FIPS) code that is unique within state. The places within consolidated cities and the "consolidated city (balance)" also are assigned five-digit FIPS place codes that are unique within state. The code assigned to each place within a consolidated city is the same as its regular place code; a place that is partially included in a consolidated city does not have a different code for the portions inside and outside the consolidated city. FIPS codes are assigned based on alphabetical sequence within each state. Incorporated places recognized in decennial census data products are those reported to the U.S. Census Bureau as legally in existence on January 1, 2000, under the laws of their respective states, as cities, boroughs, city and boroughs, municipalities, towns, and villages, with the following exceptions: the towns in the New England states, New York, and Wisconsin, and the boroughs in New York are recognized as minor civil divisions for decennial census purposes; the boroughs, city and boroughs (as in Juneau City and Borough), and municipality (Anchorage) in Alaska are county equivalents for decennial census statistical presentation purposes. In four states (Maryland, Missouri, Nevada, and Virginia), there are one or more incorporated places known as "independent cities" that are primary divisions of a state and legally not part of any county. For data presentation purposes, the U.S. Census Bureau may treat an independent city as a county equivalent, county subdivision, and place. The U.S. Census Bureau treats the villages in American Samoa as incorporated places because they have their own officials, who have specific legal powers as authorized in the American Samoa Code. The village boundaries are traditional rather than being specific, legally defined locations. There are no incorporated places in Guam and the Northern Mariana Islands. The U.S. Census Bureau treats the three towns in the Virgin Islands of the United States as incorporated places. There are a few incorporated places that do not have a legal description. An incorporated place is established to provide governmental functions for a concentration of people as opposed to a minor civil division, which generally is created to provide services or administer an area without regard, necessarily, to population. Population and housing unit density are computed by dividing the total population or number of housing units within a geographic entity (for example, United States, state, county, place) by the land area of that entity measured in square kilometers or square miles. Density is expressed as both "people (or housing units) per square kilometer" and "people (or housing units) per square mile" of land area. A public use microdata area (PUMA) is a decennial census area for which the U.S. Census Bureau provides specially selected extracts of raw data from a small sample of long-form census records that are screened to protect confidentiality. These extracts are referred to as "public use microdata sample (PUMS)" files. Since 1960, data users have been using these files to create their own statistical tabulations and data summaries. For Census 2000, state, District of Columbia, Puerto Rico, and Island Area participants, following U.S. Census Bureau criteria, delineated two types of PUMAs within their states. PUMAs of one type comprise areas that contain at least 100,000 people. The PUMS files for these PUMAs contain a 5-percent sample of the long-form records. The other type of PUMAs, super-PUMAs, comprise areas of at least 400,000 people. The sample size is 1 percent for the PUMS files for super-PUMAs. PUMAs cannot be in more than one state or statistically equivalent entity. The larger 1-percent PUMAs are aggregations of the smaller 5-percent PUMAs. PUMAs of both types, wherever the population size criteria permit, comprise areas that are entirely within or outside metropolitan areas or the central cities of metropolitan areas. The U.S. Census Bureau treats the Commonwealth of Puerto Rico as the statistical equivalent of a state for data presentation purposes. Each state and statistically equivalent entity is assigned a two-digit Federal Information Processing Standards (FIPS) code in alphabetical order by state name, followed in alphabetical order by Puerto Rico and the Island Areas. Each state and statistically equivalent entity also is assigned the two-letter FIPS/U.S. Postal Service code. The primary legal divisions of Puerto Rico are termed "municipios." For data presentation purposes, the U.S. Census Bureau treats a municipio as the equivalent of a county in the United States. Each municipio is assigned a unique three-digit Federal Information Processing Standards (FIPS) code in alphabetical order within Puerto Rico. The U.S. Census Bureau recognizes barrios and barrios-pueblo as the primary legal divisions of municipios. These entities are similar to the minor civil divisions (MCDs) used for reporting decennial census data in 28 states of the United States. Subbarrios in 23 municipios are the primary legal subdivisions of the barrios-pueblo and some barrios. The U.S. Census Bureau presents the same types of Census 2000 data for these "sub-MCDs" as it does for the barrios and barriospueblo. (There is no geographic entity in the United States equivalent to the subbarrio.) Each barrio, barrio-pueblo, and subbarrio is assigned a five-digit Federal Information Processing Standards (FIPS) code in alphabetical order within Puerto Rico. Each zona urbana and comunidad is assigned a five-digit Federal Information Processing Standards (FIPS) code in alphabetical order within Puerto Rico. School districts are geographic entities within which state, county, or local officials or the Department of Defense provide public educational services for the areas residents. The U.S. Census Bureau obtains the boundaries and names for school districts from state officials. The U.S. Census Bureau first provided data for school districts in conjunction with the 1970 census. For Census 2000, the U.S. Census Bureau tabulated data for three types of school districts: elementary, secondary, and unified. Each school district is assigned a five-digit code that is unique within state. School district codes are assigned by the Department of Education and are not necessarily in alphabetical order by school district name. States are the primary governmental divisions of the United States. The District of Columbia is treated as a statistical equivalent of a state for data presentation purposes. For Census 2000, the U.S. Census Bureau also treats a number of entities that are not legal divisions of the United States as statistically equivalent to a state: American Samoa, the Commonwealth of the Northern Mariana Islands, Guam, Puerto Rico, and the Virgin Islands of the United States. Each state and statistically equivalent entity is assigned a two-digit numeric Federal Information Processing Standards (FIPS) code in alphabetical order by state name, followed in alphabetical order by Puerto Rico and the Island Areas. Each state and statistically equivalent entity also is assigned a two-letter FIPS/U.S. Postal Service code and a two-digit census code. The census code is assigned on the basis of the geographic sequence of each state within each census division; the first digit of the code identifies the respective division, except for Puerto Rico and the Island Areas, which are not assigned to any region or division. The census regions, census divisions, and their component states are listed in Figure A-3. State legislative districts (SLDs) are the areas from which members are elected to state legislatures. The SLDs embody the upper (senate) and lower (house) chambers of the state legislature. (Nebraska has a unicameral legislature that the U.S. Census Bureau treats as an upper-chamber legislative area for data presentation purposes. There are, therefore, no data by lower chamber.) A unique census code of up to three characters, identified by state participants, is assigned to each SLD within state. The code "ZZZ" identifies parts of a county in which no SLDs were identified. As an option in the Census 2000 Redistricting Data Program (Public Law 94-171), participating states receive P.L. 94-171 census data for their SLDs (see VOTING DISTRICT (VTD)). Not all states delineated SLDs for the purpose of presenting Census 2000 data, in which case the entire state is treated as a single SLD coded with blanks at both levels. A traffic analysis zone (TAZ) is a statistical entity delineated by state and/or local transportation officials for tabulating traffic-related census data-especially journey-to-work and place-of-work statistics. A TAZ usually consists of one or more census blocks, block groups, or census tracts. For the 1990 census, TAZs were defined as part of the Census Transportation Planning Package (CTPP). The U.S. Census Bureau first provided data for TAZs in conjunction with the 1980 census, when it identified them as "traffic zones." Each TAZ is identified by a six-character alphanumeric code that is unique within county or statistically equivalent entity. For the 1990 census, TAZ codes were unique within CTPP area, which generally conformed to a metropolitan area. Less densely settled blocks that form enclaves or indentations, or are used to connect discontiguous areas with qualifying densities. Rural consists of all territory, population, and housing units located outside of UAs and UCs. Geographic entities, such as metropolitan areas, counties, minor civil divisions (MCDs), and places, often contain both urban and rural territory, population, and housing units. 1This definition will not be final until its publication in the final Federal Register Notice, which will take place in the summer of 2001. The U.S. Census Bureau introduced the UC for Census 2000 to provide a more consistent and accurate measure of the population concentration in and around places. UCs replace the provision in the 1990 and previous censuses that defined as urban only those places with 2,500 or more people located outside of urbanized areas. The title of a UC may contain up to three incorporated place names, and will include the two-letter U.S. Postal Service abbreviation for each state into which the UC extends. However, if the UC does not contain an incorporated place, the UC title will include the single name of the geographic entity that occurs first from the following list: census designated place (CDP), minor civil division (MCD), or populated place recognized by the U.S. Geological Survey. Each UC is assigned a five-digit census code in alphabetical sequence on a nationwide basis. The alphabetic assignment of codes for urban areas includes both urbanized areas (UAs) and UCs. A separate flag is included in data tabulation files to differentiate between UAs and UCs. In printed reports, this differentiation is included in the name. An urbanized area (UA) consists of densely settled territory that contains 50,000 or more people. The U.S. Census Bureau delineates UAs to provide a better separation of urban and rural territory, population, and housing in the vicinity of large places. At least 35,000 people in a UA must live in an area that is not part of a military reservation. For Census 2000, the UA criteria specify that the delineations be performed using a zero-based approach. Because of the more stringent density requirements and the less restrictive extended place criteria, some territory that was classified as urbanized for the 1990 census has been reclassified as rural. (Area that was part of a 1990 UA has not been automatically grandfathered into the 2000 UA.) In addition, some areas that were identified as UAs for the 1990 census have been reclassified as urban clusters. The places population size is at least 2/3 of the most populous UA central place. The title of a UA may contain up to three incorporated place names, and will include the two-letter U.S. Postal Service abbreviation for each state into which the UA extends. However, if the UA does not contain an incorporated place, the UA title will include the single name of the geographic entity that occurs first from the following list: census designated place (CDP), minor civil division (MCD), or populated place recognized by the U.S. Geological Survey. Each UA is assigned a five-digit census code in alphabetical sequence on a nationwide basis, interspersed with the codes for urban clusters (UCs), also in alphabetical sequence. For the 1990 census, the U.S. Census Bureau assigned a four-digit UA code based on the metropolitan area codes. For Census 2000, a separate flag is included in data tabulation files to differentiate between UAs and UCs. In printed reports, this differentiation is included in the name. As a result of the urbanized area (UA) and urban cluster (UC) delineations, an incorporated place or census designated place may be partially within and partially outside of a UA or UC. Any place that is split by a UA or UC is referred to as an extended place. For the 1990 and previous censuses, extended places were called extended cities. An extended city had to contain either 25 percent of the total land area or at least 25 square miles with an overall population density lower than 100 people per square mile. Such pieces of territory had to cover at least 5 square miles. This low-density area was classified as rural and the other, more densely settled portion of the incorporated place was classified as urban. For the 1970 and 1980 censuses, the U.S. Census Bureau identified extended cities only within UAs. For the 1990 census, the U.S. Census Bureau also applied this classification to qualifying incorporated places located outside UAs. Documentation of the UA, UC, and extended place criteria is available from the Geographic Areas Branch, Geography Division, U.S. Census Bureau, Washington, DC 20233-7400; telephone 301-457-1099. An urban growth area (UGA) is a legally defined geographic entity in Oregon that the U.S. Census Bureau includes in the TIGER® database in agreement with the state. UGAs, which are defined around incorporated places, are used to control urban growth. UGA boundaries, which need not follow visible features, are delineated cooperatively by state and local officials and then confirmed in state law. UGAs are a new geographic entity for Census 2000. Each UGA is identified by a five-digit census code, which generally is the same as the Federal Information Processing Standards (FIPS) code for the incorporated place for which the UGA is named. The codes are assigned alphabetically within Oregon. Voting district (VTD) is the generic name for geographic entities, such as precincts, wards, and election districts, established by state, local, and tribal governments for the purpose of conducting elections. States participating in the Census 2000 Redistricting Data Program as part of Public Law 94-171 (1975) may provide boundaries, codes, and names for their VTDs to the U.S. Census Bureau. The U.S. Census Bureau first reported data for VTDs following the 1980 census. Because the U.S. Census Bureau requires that VTDs follow boundaries of census blocks, participating states often adjusted the boundaries of the VTDs they submit to conform to census block boundaries for data presentation purposes. If requested by the participating state, the U.S. Census Bureau identifies the VTDs that have not been adjusted as an "A" for actual in the VTD indicator field of the PL data file. The VTD indicator for all other VTDs is shown as "P" for pseudo. For Census 2000, each VTD is identified by a one- to six-character alphanumeric census code that is unique within county. The code "ZZZZZZ" identifies parts of a county in which no VTDs were identified. For a state or county that did not participate in the VTD project, the code fields are blank. A ZIP Code® tabulation area (ZCTA) is a statistical geographic entity that approximates the delivery area for a U.S. Postal Service five-digit or three-digit ZIP Code. ZCTAs are aggregations of census blocks that have the same predominant ZIP Code associated with the residential mailing addresses in the U.S. Census Bureau's Master Address File. Three-digit ZCTA codes are applied to large contiguous areas for which the U.S. Census Bureau does not have five-digit ZIP Code information in its Master Address File. ZCTAs do not precisely depict ZIP Code delivery areas, and do not include all ZIP Codes used for mail delivery. The U.S. Census Bureau has established ZCTAs as a new geographic entity similar to, but replacing, data tabulations for ZIP Codes undertaken in conjunction with the 1990 and earlier censuses. Alaska Native Regional Corporations (ANRCs) are legally established corporate entities established to conduct both business and nonprofit affairs of Alaska Natives. Twelve ANRCs cover most of the state of Alaska. A Census Bureau term referring to these types of geographic areas: federal and state American Indian reservations, American Indian off-reservation trust land (individual or tribal), Oklahoma tribal statistical area (in 1990 tribal jurisdictional statistical area), tribal designated statistical area, state designated American Indian statistical area, Alaska Native Regional Corporation, Alaska Native village statistical area, and Hawaiian home lands. Adjacent New England City and Town Areas (see glossary term New England City and Town Area) that have a high degree of employment interchange may be combined to form Combined New England City and Town Areas (or CNECTAs). New England City and Town Areas that are part of a CNECTA retain their separate identities. Defined by the federal Office of Management and Budget for use by federal statistical agencies according to the Census data, adjacent metropolitan and micropolitan statistical areas (see glossary term Metropolitan Statistical Area/Micropolitan Statistical Area) may be combined to form a CSA if the areas have a high degree of employment interchange. Each metropolitan or micropolitan statistical area retains its own identity. An area established by State officials or the courts for the purpose of electing a person to the U.S. House of Representatives. Within each State, these areas must contain, as nearly as possible, an equal number of inhabitants. The number of Congressional districts in each State may change after each decennial census, and the boundaries may be changed more than once during a decade. In the District of Columbia and Puerto Rico, a single CD is created consisting of the entire area. The representative is termed a delegate or resident commissioner, respectively and does not have voting rights in Congress. Core Based Statistical Area is a collective term for both metropolitan and micropolitan areas (see glossary term Metropolitan Statistical Area/Micropolitan Statistical Area). A type of governmental unit that is the primary legal subdivision of most states. In Louisiana, these subdivisions are known as parishes. In Alaska, which has no counties, the county equivalents are boroughs, a legal subdivision, and census areas, a statistical subdivision. In four states (Maryland, Missouri, Nevada and Virginia), there are one or more cities that are independent of any county and thus constitute primary subdivisions of their states. The District of Columbia has no primary divisions, and the entire area is considered equivalent to a county for statistical purposes. In Puerto Rico, municipios are treated as county equivalents. A legal or statistical division of a county recognized by the Census Bureau for data presentation. The two major types of county subdivisions are census county divisions and minor civil divisions. A grouping of States within a census geographic region established by the Census Bureau for the presentation of census data. The current nine divisions (East North Central, East South Central, Middle Atlantic, Mountain, New England, Pacific, South Atlantic, West North Central, and West South Central) are intended to represent relatively homogeneous areas that are subdivisions of the four census geographic regions. A metropolitan statistical area (see glossary term Metropolitan Statistical Area/Micropolitan Statistical Area) with population greater than 2.5 million may be divided into smaller groups known as metropolitan divisions. Metropolitan and micropolitan statistical areas (metro and micro areas) are geographic entities defined by the federal Office of Management and Budget for use by federal statistical agencies, based on the concept of a core area with a large population nucleus, plus adjacent communities having a high degree of economic and social integration with that core. The term "Core Based Statistical Area" (CBSA) is a collective term for both metro and micro areas. Qualification of a metro area requires the presence of a city with 50,000 or more inhabitants, or the presence of an Urbanized Area (UA) and a total population of at least 100,000 (75,000 in New England). The county or counties containing the largest city and surrounding densely settled territory are central counties of the metropolitan area. Additional outlying counties qualify to be included in the metro area by meeting certain other criteria of metropolitan character, such as a specified minimum population density or percentage of the population that is urban. Metro areas in New England are defined in terms of minor civil divisions, following rules concerning commuting and population density. A micro area contains an urban core of at least 10,000 (but less than 50,000) population. Each metro or micro area consists of one or more counties and includes the counties containing the core urban area, as well as any adjacent counties that have a high degree of social and economic integration (as measured by commuting to work) with the urban core. is a geographic entity defined by the federal Office of Management and Budget for use by federal statistical agencies in describing aspects of the New England region in the United States. NECTA is based on the concept of a core area with a large population nucleus, plus adjacent communities having a high degree of economic and social integration with that core. Similar to the metropolitan and micropolitan statistical areas (see glossary term Metropolitan Statistical Area/Micropolitan Statistical Area), a metropolitan NECTA has an urban core of at least 50,000 population, while a micropolitan NECTA has an urban core of at least 10,000 inhabitants but less than 50,000. A NECTA (see glossary term New England City and Town Area) with population greater than 2.5 million may be divided into smaller groups known as NECTA Divisions. The largest city of a Metropolitan/Micropolitan Statistical Area (see glossary term), plus additional cities that meet minimum standards of population thresholds. An area that defines the extent of territory for which the Census Bureau tabulates public use microdata samples (see glossary term Public Use Microdata Samples). A concentration of population either legally bounded as an incorporated place, or identified as a Census Designated Place (CDP) including comunidades and zonas urbanas in Puerto Rico. All incorporated places recognized legally as in existence under the laws of their respective states as cities, boroughs, towns, and villages, with the following exceptions: the towns in the New England states, New York, and Wisconsin, and the boroughs in New York are recognized as minor civil divisions for census purposes; the boroughs in Alaska are county equivalents. A statistical entity, defined for each decennial census according to Census Bureau guidelines, comprising a densely settled concentration of population that is not within an incorporated place, but is locally identified by a name. CDPs are delineated cooperatively by state and local officials and the Census Bureau, following Census Bureau guidelines. These entities were called unincorporated places for the 1940 through 1970 censuses. Four groupings of states (Northeast, South, Midwest, and West) established by the Census Bureau in 1942 for the presentation of census data. Northeast Region: Maine, New Hampshire, Vermont, Massachusetts, Connecticut, Rhode Island, New Jersey, New York and Pennsylvania. South Region: Maryland, Delaware, District of Columbia, West Virginia, Virginia, Kentucky, Tennessee, North Carolina, South Carolina, Georgia, Florida, Alabama, Mississippi, Arkansas, Louisiana, Oklahoma and Texas. Midwest Region: North Dakota, South Dakota, Nebraska, Kansas, Missouri, Iowa, Minnesota, Wisconsin, Illinois, Michigan, Indiana and Ohio. West Region: Washington, Idaho, Montana, Wyoming, Oregon, California, Nevada, Utah, Colorado, Arizona, New Mexico, Alaska and Hawaii. Puerto Rico and the Island areas are not part of any region. The territory administered by the elected or appointed authorities of a State, county, or other local governmental unit to provide educational services to a resident population. A school district typically includes several school buildings, teachers, and related staff. The Census Bureau provided data tabulations for school districts from the 1970, 1980, and 1990 censuses. Elementary School Districts are school districts inclusive of kindergarten through either the eighth or ninth grade. A school district inclusive of only high school (either the ninth through the twelfth grades or the tenth through the twelfth grades). Unified School Districts are school districts inclusive of kindergarten through twelfth grade. A type of governmental unit that is the primary legal subdivision of the United States; a functioning county equivalent in Palau, where it also serves as a nonfunctioning MCD. The District of Columbia, Puerto Rico and the Island Areas (the U.S. Virgin Islands, Guam, American Samoa, and the Northern Mariana Islands) are each treated as the statistical equivalent of a state for census purposes. Land area, water area, population counts, and housing unit counts for the United States, Regions and Divisions that do not include Puerto Rico. For Census Bureau purposes, the territory within UAs and the urban portion of places outside of UAs that have a decennial census population of 2,500 or more. Other Federal Government agencies may define the term based on different criteria.